The beginning of 2015 saw the purchase of content management platforms EPiServer and Ektron by Accel-KKR. Following this acquisition, the buyer subsequently decided to create a single platform in the Cloud that is capable of being a leader in digital experience delivery. This has made it imperative for Ektron customers to migrate to EPiServer. In this merger, EPiServer was declared to be the overarching brand. Over the past year, we have witnessed the growth of EPiServer and Ektron under the banner of Digital Experience Cloud. 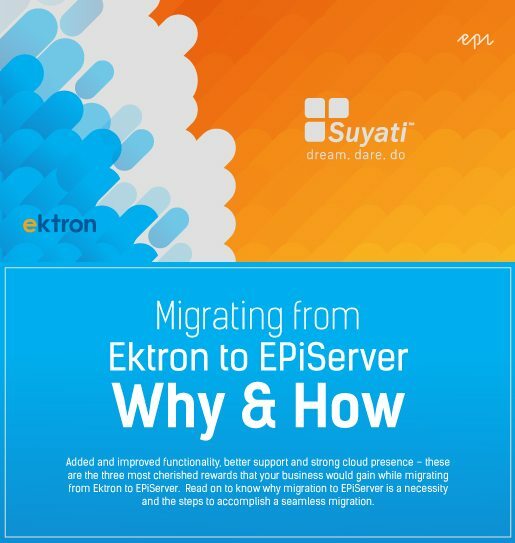 Added and improved functionality, better support and strong cloud presence – these are the three most cherished rewards that your business would gain while migrating from Ektron to EPiServer. Read on to know why migration to EPiServer is a necessity and the steps to accomplish a seamless migration. Download your copy now to have full access to the whitepaper!